You're pretty creative if you are considering a gift certificate to Be Theatre. We are super impressed with your gift-giving skills. Especially if your kinda cheap and you need good ideas that don't cost an arm and a leg. After all, experiences are better than a bunch of stuff, right? And we all have plenty of stuff. 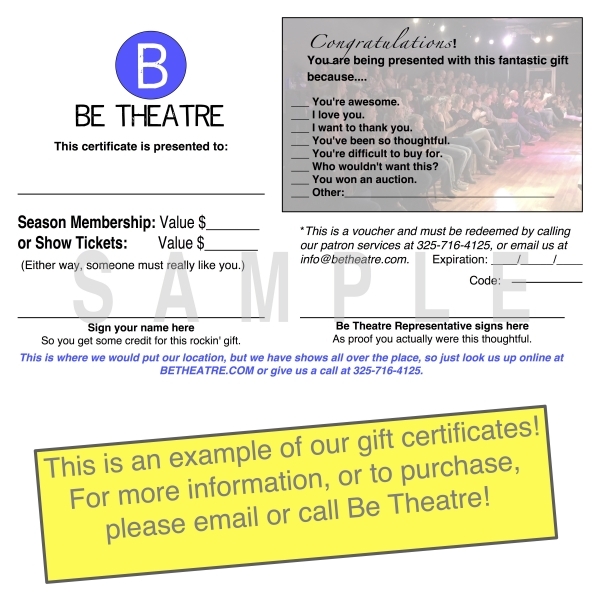 This is an example of our gift certificate. We think it's pretty clever, but if you have a better idea, keep it to yourself because it is what it is. To purchase, give us a call, or better yet, email us because we have wonky office hours. If you have a benefit coming up and need an item for auction or donation, we enjoy giving back to the community, so email to inquire about how we can support your charitable cause. We donate to non-profit organizations only.